This Solid Mahogany Wood Songbird Birdhouse with Shiny Copper Roof has a stylish hexagonal body of solid cypress and a six sided roof. Remove roof and clean out debris, spray with a mild bleach and water solution then rinse thoroughly and let dry in the sun. 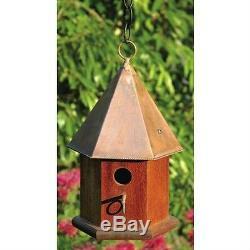 Solid Mahogany Wood Songbird Birdhouse with Shiny Copper Roof. Hanging loop and matching copper perch complete the look, with easy cleanout and optional mounting. Clean outs, ventilation and drainage built in. Hand crafted in the USA. Details: Handcrafted of solid cypress. Weather Resistant Details: Weather resistant finish. Tools Needed for Assembly: Screwdriver and drill. Parts Needed: Chain or rope for hanging or screws and plate with post for mounting. Bird House Design: Hanging; Mounted. Hardware Material: Solid copper roof with copper perch and hanging loop. Number of Compartments: Single compartment. Removable Section: Roof comes off for easy cleaning. Nesting Height: 60"-72" or higher Feet. Outdoor Use: Place in a spot with afternoon shade. Animal Capacity: Enough room for 1 family of birds. Country of Manufacture: United States. Overall Height - Top to Bottom: 15 Inches. Overall Width - Side to Side: 7 Inches. Overall Depth - Front to Back: 7 Inches. Hole Size: 1.25 Inches. The item "Solid Mahogany Wood Songbird Birdhouse with Shiny Copper Roof" is in sale since Thursday, July 13, 2017. This item is in the category "Home & Garden\Yard, Garden & Outdoor Living\Bird & Wildlife Accessories\Birdhouses". The seller is "righthope" and is located in 92867.